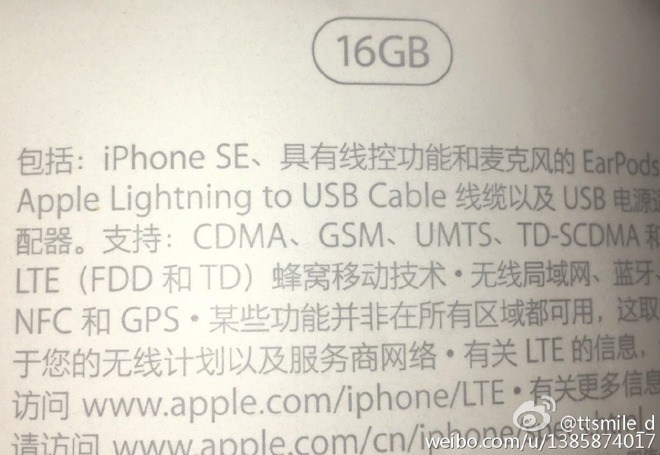 Nefarious supply chain personnel in China seem to have once again defied their non-disclosure agreements, snapping what is said to be a photo of the specifications sticker affixed to the box for Apple's iPhone 5c successor. According to the sticker, Apple will drop the "5" from the new handset's name, sticking instead with "iPhone SE." The device will be available in a 16-gigabyte capacity and carry an NFC chip for Apple Pay support. In separate posts, the leaker intimates that the iPhone SE will also be available in a 64-gigabyte configuration, with four color choices —presumably silver, space gray, gold, and rose gold. The tipster also wrote that the overall design of the iPhone SE is similar to the iPhone 6s, which matches up with numerous previous predictions. Other than the size and general design, however, very little information about Apple's upcoming small iPhone has leaked. Analysts are split on whether the device will run the A9 chip or an older variant, and while there is some evidence to suggest that the iPhone SE may carry a 4K-capable camera, that remains far from certain. For those who are interested, one video posted to Chinese video sharing site Youku shows what appears to be an iPhone 5s transposed into a smaller iPhone 6-style body, giving a good idea of what the new handset might look like. The makers of the video reiterate the speculation of an included A9, though since the device is not legitimate that information may not be either. The mystery will be cleared up in less than a week when Apple is expected to unveil the iPhone SE —along with a new iPad Air —at an event in Cupertino.